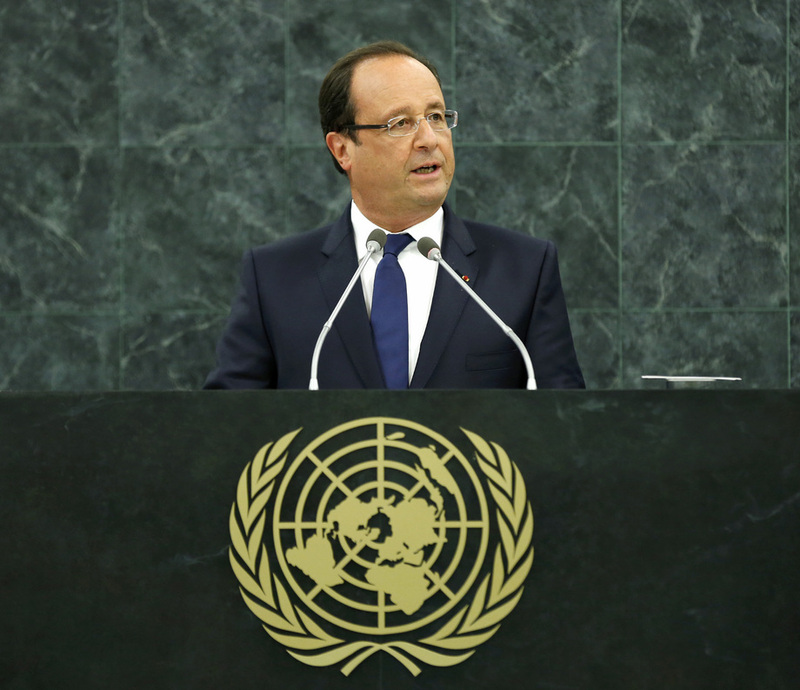 FRANÇOIS HOLLANDE, President of France, said it was up to the United Nations to act where people’s liberty was threatened, where their fundamental rights were compromised and where extremism disrupted international security. To that end, action in Syria was essential, where 90,000 people had died in the last year and where a quarter of the population was displaced. The worst moment had come on 21 August, when chemical weapons were used against civilians. United Nations inspectors had confirmed their use. France had wanted strong action against that violation of international law and to dissuade the regime from similar action in the future. He said that that pressure had prompted negotiations in the Security Council to ensure verification and destruction of chemical weapons. The text, when agreed, needed to open the possibility for the Council to be seized of the issue of chemical weapons at any moment; it needed to envisage coercive measures under Chapter VII of the United Nations Charter in response to the Syrian regime’s failure to commit, as those who committed such crimes must be held accountable. After the resolution was adopted, work must continue to ensure that the war — the deadliest of the century — was ended. A political solution was the only option, he said, but too much time had been lost due to Security Council inaction. The regime had taken advantage by increasing its violence, while extremists had poured in. The Geneva II conference needed to happen and it had to make decisions, not hold discussions. The goal was to see a transitional Government that could establish peace, protect all communities and organize elections. There was real humanitarian urgency stemming from the refugee crisis, with Lebanon directly threatened by the protracted tragedy; 20 per cent of its current population was of Syrian origin. There were glimmers of hope in the Middle East, he said, looking to the resumed negotiations between Israel and Palestine. An opportunity for coexistence between two States should be seized finally, ending a conflict that had local, regional and global repercussions. Another glimmer could be seen in the statements of the new Iranian President. The question was whether his words would translate into action, especially on the nuclear issue. Continued lack of headway in discussions had led the international community to impose increasingly harsh sanctions on Iran. He expected concrete gestures from Iran, including rejection of a military nuclear programme, adding that, while in favour of dialogue with President Rouhani, he was firm on the issue of proliferation. Also of concern was Africa, which had fallen prey to terrorism, he said. Victories were possible, as in Mali, where African and French forces had responded to an appeal by the Government. Since the intervention, Mali had re-established territorial integrity, ensured security of its population and held a credible Presidential election. Threats remained in the Sahel, and in Libya, where the authorities still needed assistance. He also raised an alarm about the situation in the Central African Republic, where chaos had taken root, preying on civilians. A Security Council-mandated African force was needed to re-establish stability. Elsewhere in Africa, in the Democratic Republic of the Congo, the United Nations Organization Stabilization Mission there, known as MONUSCO, needed continued support, and the Addis Ababa Accord should be applied without interference. Events in Somalia and Kenya showed that Al-Shabaab still posed a threat, requiring continuing international support of African countries. In that light, France was organizing a peace and security summit in Africa later in 2013. The best chance for peace and security was through policies supporting development, he said, underlining the link between poverty and terrorism. Funds were needed to build essential infrastructure and ensure access to basic public goods. France supported innovative sources of financing for development, such as the tax on airline tickets. He had recently raised that tax to help combat AIDS, tuberculosis and malaria. A tax on financial transactions, with 10 per cent of the proceeds allocated to development, enabled improvements in the poorest countries, increased security and helped to combat climate change. He hoped for an equitable agreement on the latter issue by 2015, with developed and developing countries alike accepting their respective roles. Any deal should be binding, and to ensure progress, a concrete call to action was needed, backed by the threat of sanctions. He said that the most serious threat of all was inaction; the worst decision was no decision; and the worst danger was to see no danger. Every time the United Nations did not act, peace suffered. That was the basis of his call for a code of good conduct for the permanent members of the Security Council, with the threat of loss of veto for violations. Additionally, he called for strengthened powers of investigation for the Secretary-General. The United Nations’ power rested on its ability to intervene rapidly and effectively, to promote development and to preserve future generations. It held legitimacy through its Charter and needed to honour it.